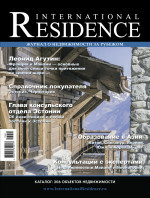 International Residence Magazine is the leading overseas property magazine covering Russia and the Russian speaking countries of the CIS. First published in 2003, International Residence has been at the leading edge of the developing Russian market since it's conception. Our professional advice and clear information has assisted many hundreds of wealthy Russian buyers to choose their destination and purchase the property of their dreams. The leading overseas property magazine in Russia, printed bi-annually since 2003 reaching affluent buyers and investors throughout Russia. "How to sell to potential Russian buyers". Our free e-book, written by Kim Waddoup, CEO of the aiGroup and the leading authority on this market, subscribe now and we will send your free copy.